Hi folks, Doc here. 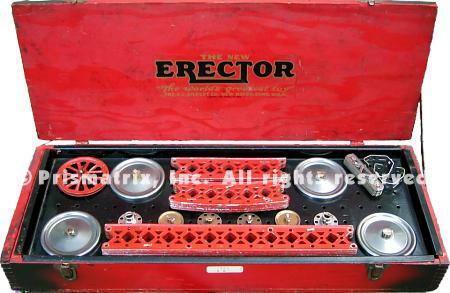 Here's a set from the Classic Period of Gilbert Erector that is a real favorite among collectors, the No. B. "Ferris Wheel" Accessory set. Although a number of Ferris wheel model designs appeared in Erector manuals over the years, most Erector fans and collectors, myself included, consider the Classic Period version to be the finest of them all. In 1928, Gilbert created the No. B set specifically to build this "new" Ferris wheel. The set featured six brand new parts, including the EX, EY, and EZ "big channel" girders, for use in the model. These parts were only available in one other set that year, the top-of-the-line No. 10. The No. B Accessory Set was produced for five years: 1928-32. The set changed very little over its lifespan; the 1929 version is featured in this pictorial. The No. B came packed in a red and black painted wooden box measuring 21¼" x 8½" x 3¼", with brass sidegrips and suitcase latches (shown above). The parts were packed in two layers, the top layer being a black painted removable metal tray. The photos below show the layout and contents of the set. An assortment of wheels, pulleys, and girders, including four polished DV disk wheels, were arranged on the metal upper tray and attached to it with t-clips (shown below). Beneath the tray, some of the remaining parts were organized in three small part boxes and one cardboard tray, while others were clipped to the large base plates or simply stacked loosely in the box. As I mentioned at the beginning, the No. 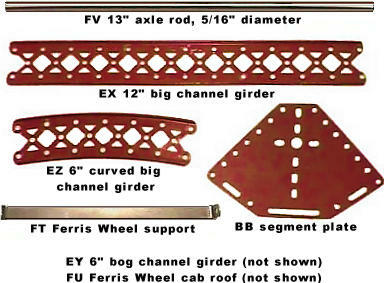 B set included a number of special parts for use in building this version of the Ferris Wheel. There were six parts in all, including five new parts and one old one. Of these special parts, only the three big channel girders would continue on in the Erector line beyond the Classic Period. The instructions provided for the Ferris Wheel were limited to a single page in the instruction manual (shown below). To see photos of the actual model, visit my Model Gallery here at Girders & Gears.